Discussion in 'Tools and Materials' started by scooby1, 26 Sep 2018. I know this is a stupid question but apart from hanging it from the Eiffel Tower I can't think of a way to get all the twists out of my builder's line. It's one of those old fashioned jobbies with pointed dagger-like things that the twine is wound around and I am obviously winding it up incorrectly because as soon as I try and set up a line it just curls up into a tangled mess. If I lay it out in the yard for a few hours with each end detached from the metal will it straighten itself out or will it just curl up into a ball and die ? TIA for any tips. No questions are stupid, only answers. If you can lay it out and untwist it, line can often regain its shape if it is stretched while untwisted (run between gloved fingers etc.). Not suer about your twine, perhaps a new twine is required? surely its not expensive? Thanks for the quick response. I think I'l try laying it out. New twine ???? Ouch ! I've only had this for 28 years. Nothing lasts nowadays does it. I have a home brew bucket that is 34+ years old that I use for wallpaper paste or plastering mixing so I know where your coming from with the age of your line. putting a weight on one end and dangling it from a high rise building may also be a good way of untangling it, just beware of numtpies below trying to pull it down. I actually sorted it today. Put the peg at one end of the line in the soil with the line still attached and then unrolled the line off the other peg until I got to the end and then took the line off the peg and let it just lie on the ground. 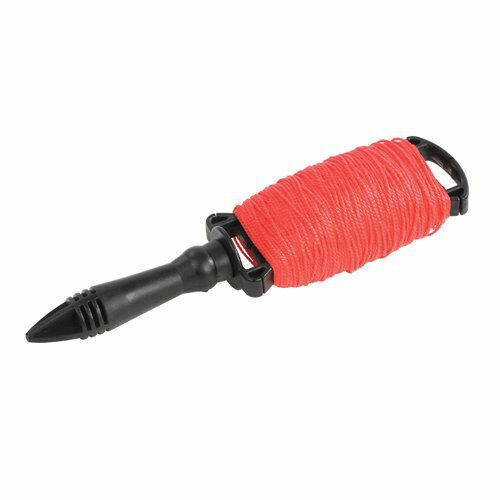 Went back to the first peg, picked up the line and holding it up in the air walked towards the end of the line (about 15-20 yards) I had to do this about 6-8 times but got all the twists out of it and then re-attached it to the peg again. Perfect. Good for another 28 years again now. which is fast for rolling out. Not so fast for reeling in so some people just wind them around the reel. So each turn twists the line as you roll it up. When its reeled out again the twists become apparent. When its rolled up again the twists become even worse. You dangle the pin, it unravels. You wrap that bit of line. Rinse, repeat. The trick is to wrap the line in a way that minimises twisting the line. It's all in the wrist, I can't explain it, but you don't wind it like sellotape. Yes, that is what I have been doing wrong, i.e. winding it up the wrong way. But it's such a pain turning the pin round instead of just holding the pin with the right hand and wizzing the line round and round it with the left hand. My way was quicker. Took less than 5 minutes to untwist the whole line. To prevent it twisting you have to turn the pin round instead just wrapping the line round the pin. But it's too slow doing it like that until you've got a lot of line on the pin giving a larger diameter. I have a flag pole so next time I might try your way but the pole isn't 15-20 yards high so it would still have to be done in 3 goes. Why can't we have lines made in a similar way to measuring tapes, self retracting ? Get an old fly reel and glue it to the pin. I've a DeWalt D024K, SDS question? I'm about to punch a wall. Help. Bandsaw question/rant. Creter: Stupid gimmick or handy time-saver?